It's that point in the year where everyone is feeling a bit run down. Rushing around doing last minute Christmas errands today, all I heard was people coughing, snuffling and sighing into their coffees about how tired/poorly they felt. In our house, we've all had the obligatory hacking cough although my little 9 month old daughter got over it most quickly and with less moaning than her parents. We're now in need of a bit of a health boost pre-Christmas so I've been trying to cook lots of fresh, virus-busting and arthritis-fighting meals. This easy salmon recipe has been one of our favourites. It's incredibly quick and easy to make but the sesame crust transforms the salmon into something really special. I like to use white miso paste to coat the salmon but if you prefer you can just use sweet chilli sauce or any other sticky sauce you particularly like. When my arthritis is difficult I sometimes struggle to grate fresh ginger and use the ready made paste instead - it's not quite as aromatic but it does the job. 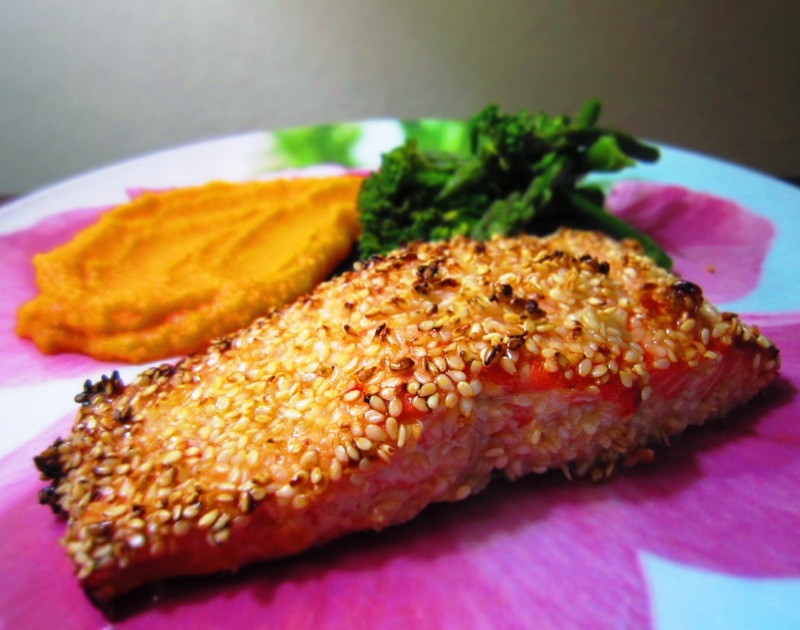 Sesame seeds are an excellent source of calcium and combined with the omega 3 oils in the fish you have a lovely bone boosting supper for arthritis. I like to serve it with sweet potato mash and green vegetables smothered in garlic and ginger - a sure fire way to help send the lurgy away until this time next year! Mix the miso paste, chilli sauce and ginger together in a small dish. Brush the top top and sides of the salmon fillets with the marinade and then sprinkle each one with a tablespoon of sesame seeds. Pat the sesame seeds on to make sure they stick. Put the coated salmon fillets on the baking tray and bake for 12-15 minutes (depending on the thickness of your salmon fillets), then switch the oven onto the HIGH grill setting and grill for 3 minutes or until the sesame crust is golden. Serve immediately. Those of you who follow me on twitter (@CookArthritis) will know that my KitchenAid food processor broke for good a few weeks ago. We hadn't had a good history together. The bowl cracked on me after the 5th use and was impossible to replace, it was difficult to assemble and then finally the locking mechanism broke two weeks out of warranty and leaving the blade dangerously running with the lid open. Cue lots of cursing and asking people which food processor they would recommend for people with arthritis. Time and time again people recommended a Magimix, so after a bit of research, I picked up the 5200XL when it was on offer and here is my verdict on whether it is cooking with arthritis must-have or must-avoid. Ps. The Guardian Money ran an interesting column last week (which mention Cooking with Arthur) on people's rights when buying kitchen equipment with arthritis. The gist of it is, if you can't use something because of your arthritis then you are entitled to return it in the UK under the Sale of Goods Act because it 'isn't fit for purpose'. You can read the full piece here. 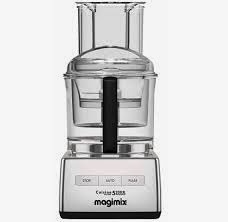 The Magixmix 5200XL is a family sized premium food processor with a capacity of up to 1.8 litres and extra wide feeder tube.. It comes with three different sized bowls - a small one for chopping herbs, nuts or little portions, a midi bowl for using with the grating and slicing disks and a large bowl for making doughs, mincing, blending, whisking etc. The Magimix 5200XL also comes with a range of accessories included: a dough kit which is basically a bowl you can use in the food processor for making, proving and baking dough; a smoothie/juicing kit and a mash/puree bowl. 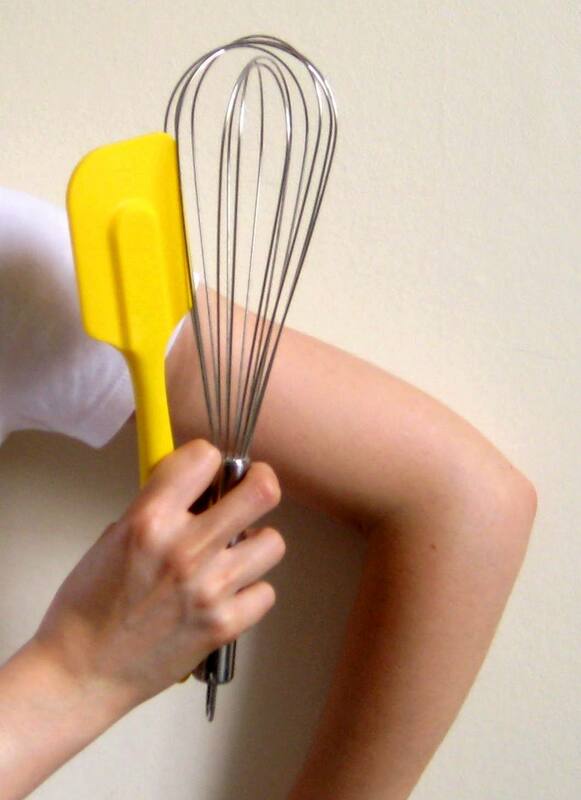 A whisk, dough blade, grating and slicing discs are also included. I've been putting the Magimix through it's paces doing a range of kitchen tasks that are difficult or time consuming with arthritis over the last few weeks and I've been pretty impressed. The basic processor function is excellent: it will mince vegetables or meat quickly and smoothly, and, unlike my old KitchenAid processor, it does so very evenly. I was a bit sceptical about the dough blade but it made lovely light scones and kneaded bread dough well although it did take longer than my stand mixer.The grating and slices plates work very well and the extra large feed tube means you can do whole slices of potato rather than having to cut them in half like you need to do with most other processors. The only attachment I haven't found brilliant is the whisk, but to be honest I've never found a food processor that can whisk egg whites as well as a stand mixer or electric whisk. Does it make it easier to cook with arthritis? I haven't tried putting the parts in the dishwasher but they are straightforward to wash up. The lid and funnel are a bit of a hassle to dry but if you aren't OCD about limescale/watermarks like me then that probably isn't a problem! The actual processor is very heavy (11kg) and quite large so I'd recommend making sure you have the counterspace to leave it out as it wouldn't be fun taking it out of a cupboard with arthritis. The Magimix 5200XL is expensive, even if you buy it on offer like I did. If you have arthritis but aren't cooking large meals or needing to blend things frequently then I think you could manage quite happily with a good handblender with mini processor attachment (more on that soon...) and a mandolin for slicing. I never ever thought I'd put a bread recipe on a blog about cooking with arthritis. I never ever made bread. As someone with arthritis, the idea of kneading dough made a homemade loaf seem like a terrible faff, and, if I'm honest, a little bit pointless when I could buy a loaf so easily. Two things have changed my attitude: the first has been buying a stand mixer. If you have arthritis, it's like having a pair of better hands. It makes quick work kneading and I can have a loaf proving in under 10 minutes. The second factor has been weaning my daughter. So much commercial bread is full of salt and flour improvers which I don't necessarily want her to be having so I've started making my own loaves. 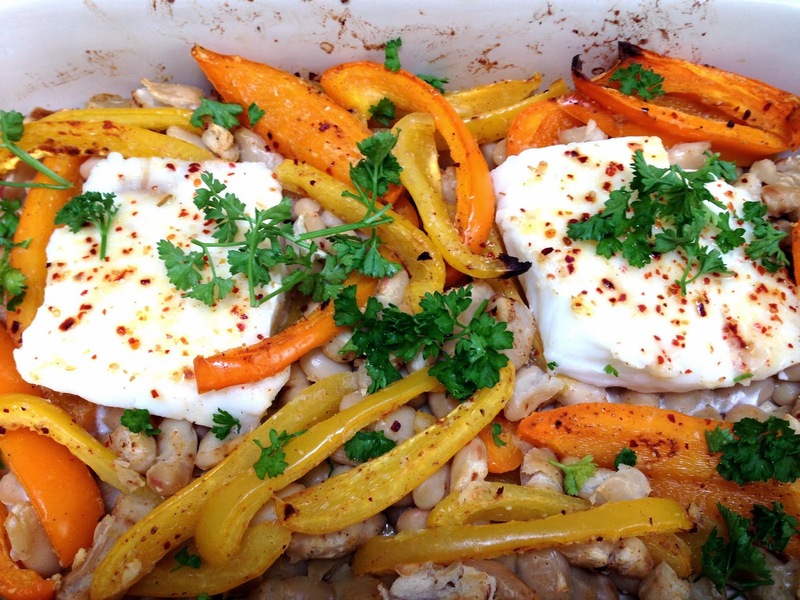 This recipe looks impressive but is actually very simple. The enriched dough is soft and easy to work with. You can alter the filling to your tastes - try cheese and red onion marmalade or make a sweet loaf with dried fruit and cinnamon. If you don't have a stand mixer, a food processor with a dough blade or electric whisk with dough hook attachment both work well. If you don't have either of these, don't despair! 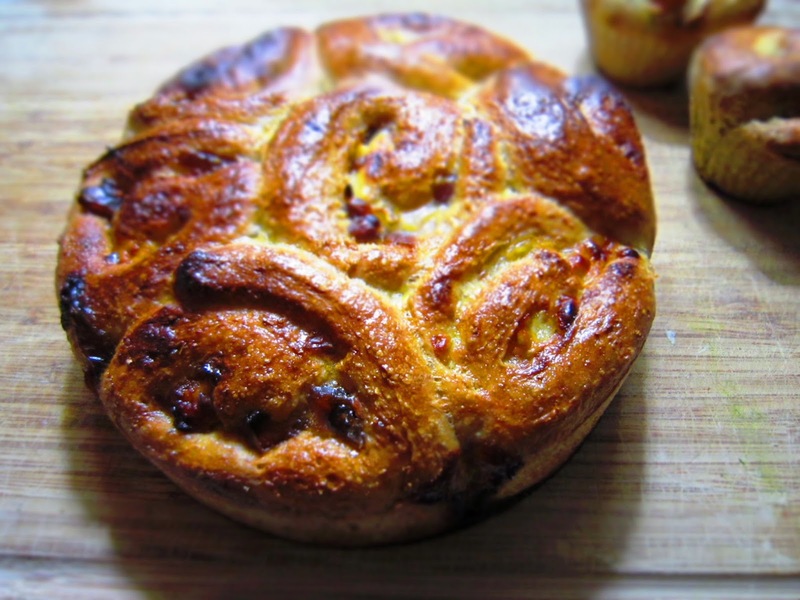 Try this great no knead bread recipe. Put the flour, yeast and salt into a large mixing bowl. Add the milk, egg and oil. Knead using a stand mixer or processor for 5 minutes or until the dough springs back slightly when poked. Cover the bowl in cling film and leave the dough to rise until doubled in size (this will take about 1hr). Tip the dough out onto an oiled board and stretch into a large rectangle. Spread with the pesto and roll up into a long sausage shape. Cut into 7 pieces and place into a 18cm cake tin. Leave to rise for another 30minutes. Brush the top with a little milk or egg for a golden crust. Bake at 180C/375F for 35minutes. Turn out of the tin and check the bottom sounds hollow when tapped, if not return to the oven for another 5 minutes. Cool on a wire rack and serve. Bread gets a bit of a bad rap but it's actually a very nutritious source of carbohydrate. Wheat flour does contains gluten which people with coeliac disease mustn't consume. Some people with enteropathic arthritis (arthritis associated with gut and bowel disorders like Crohn's or colitis) are also unable to eat gluten. Other people may suffer from an intolerance or gluten sensitivity but whether gluten has an affect on arthritis in general is more unlcear. You can read my post about it all here. - Be specific. Really consider what it is about a task that makes it challenging with arthritis. Is chopping a challenge because it is difficult to grip the knife handle or is it because you don't have enough strength in your wrists to slice accurately? The first problem could be solved by adjusting the grip on the knife, the second by switching to a sharper knife or using a cutting aid. - Be smart. You don't need to buy expensive equipment or products designed for arthritis: A wooden spoon is light, easy to grip and cheap; a piece of insulating pipe taped to a utensil with an awkward grip can make it much easier to hold; and, a simple rubbery sponge cloth can make opening jars less painful. - Be practical.Think about whether you will need to lift or move the item lots. If you don't have space on the counter for a heavy food processor and would need to get it in and out of a cupboard, a hand held stick blender with chopper attachment might be a better bet. Test out any catches or fixings to make sure things are easy for you to use and clean. I chose a Kenwood mixer over a Kitchen Aid mainly because I couldn't work the Kitchen Aid's lever when my hands hurt. I've a series of gadget reviews to help you choose kitchen equipment or read my tips on how to make the stuff you already have more arthritis friendly. My jaw arthritis has been much better since I had my daughter (an upshot of all those pregnancy hormones) so I've been fighting the urge to make up for 5 years without crisps by eating all those packets I missed! 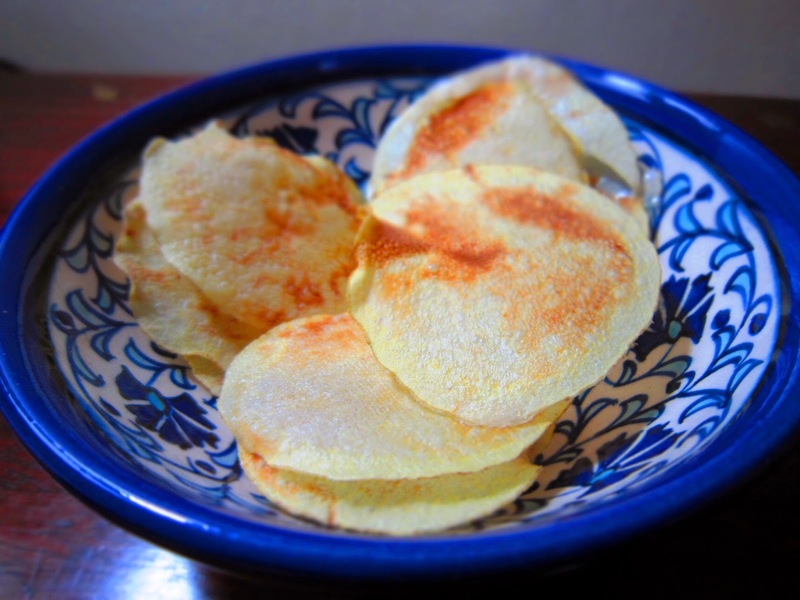 Luckily, these easy potato crisps take minutes to make and only don't contain any oil or artificial flavours. They are a great healthy treat for kids too - my little one loves gnawing on the thicker slices . Try making them with slices of carrot or sweet potato for a change. I find them easiest to make using a mandolin but a vegetable peeler also works well. If you have bad arthritis in your thumb joint, you might find a 'y' peeler better to hold. The time it takes these to cook will depend on the thickness of your potato slices and the power of your microwave so you may need to experiment a little with the first few batches. I also find that they get quicker to cook with subsequent batches because the glass plate in the microwave retains heat. 1 potato - that's it! Slice the potato very finely using a vegetable peeler or mandolin. Place the slices on a sheet of non-stick paper or kitchen roll and pop in the microwave. Cook on high for about 2-3minutes until golden and crisp. Allow to cool before removing from the sheet. For many of us, as the clocks go back, our arthritis gets active. Certainly for me, contrary to all scientific study, the winter always equals creaky joints and festive flares. 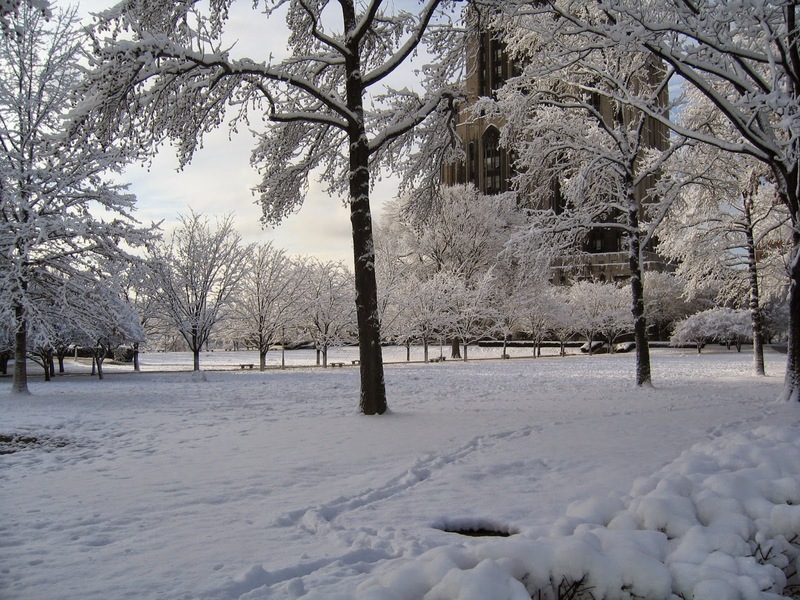 So, with cold and flu season upon us and the weather suddenly getting just that little bit chilly, I thought I would post my favourite tips and recipes for helping keeping arthritis at bay all winter. 1. Eat a rainbow - the sun may be a distant memory but eating a wide, colourful range of fruit and vegetables is an excellent way to get plenty of inflammation fighting antioxidants. Think red tomatoes, orange carrots, yellow peppers, green brocolli and purple aubergines. Try this 5-a-day pasta sauce, bright pink beetroot risotto or colourful noodle soup. 2. Spice it up - conjure up the taste of exotic holidays with recipes rich in anti-inflammatory spices, Eat plenty of turmeric spiced curries and tagines or asian ginger salmon and stir fries. 3. Cosy comforts - shun heavy fat-laden winter dishes and instead try wholesome stews, soups and puddings. This healthy shepherd's pie makes a filling supper or try this easy one-pot macaroni and cheese. Finish with this lighter chocolate mousse or tasty rice pudding. Turmeric is a really exciting spice for people with arthritis. It's been used in traditional and aryuvedic medicine for centuries to treat sore joints but is now also being investigated by scientists looking at the anti-inflammatory properties of one of it's constituent chemicals - curcumin. Turmeric goes brilliantly in curries but is also great in stews, soups or sauces. 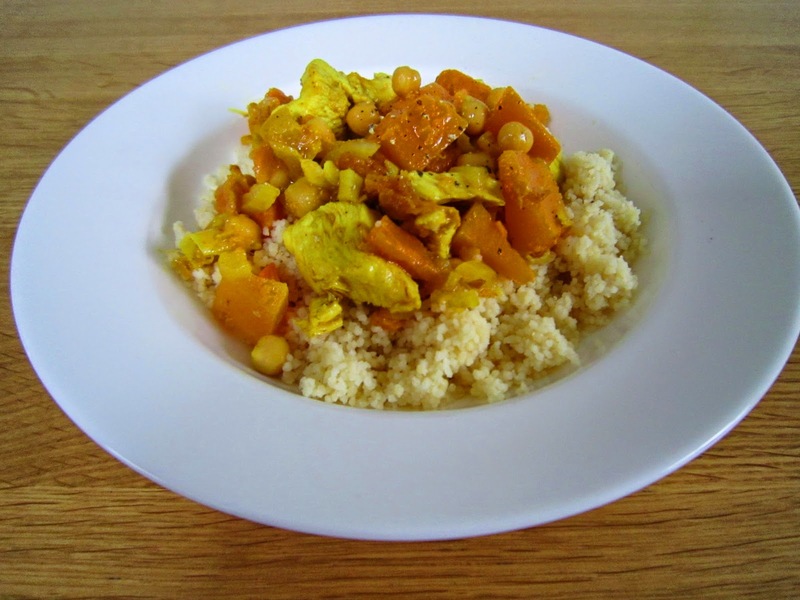 Try eating it in this easy, healthy tagine. The sweetness of the apricots, sweet potato and squash helps balance the slightly astringent taste of the turmeric whilst ginger and paprika add warm, punchy flavour. I've recently starting using ginger and garlic that comes ready prepared in tubes. It's brilliant for when my hands are sore. You can get it in jars too but for me that is no easier than chopping it as I somehow have to get the jar lid off! You could also used ground ginger and garlic granules but the taste will be a little different. Heat the oil in a medium sized casserole dish. Add the spices, garlic, ginger and chicken - gently cook for 5 minutes. Add the apricots, tomato puree, sweet potato and squash, chickpeas and stock. Bring the dish to a low simmer and cook for about 20 minutes, or until the chicken and vegetables are tender. If you are popping past a Waitrose between now and Monday, pick up a copy of Waitrose Weekend (or you can download it for free on the app store). I'm featured in it talking about how I try to manage my arthritis and there are some great diet and lifestyle tips from experts too. It's all part of National Arthritis Week (12-16th October) and Arthritis Research UK's 'Pain Killer' Campaign which is trying to shine a light on what it is really like to live with daily pain and how you, your friends and family can all help cope with it. For anyone, who has read the article and stumbled across the blog - welcome! Cooking with Arthur is my way of sharing all that I've learnt over 14 years of having arthritis and muddling on through in the kitchen. You'll find healthy, tasty recipes, tips and reviews of kitchen equipment plus a quizzical look at some of the myths around diet and arthritis. Feel free to browse around and let me know what you think in the comments section. This healthy pasta sauce recipe is packed with 5 different veg, including pepeprs and tomatoes. It is a wonderful vitamin boost if you are beginning to feel a bit run down with Autumn aches and pains. Better still, I'm yet to meet someone who doesn't like it - both my tomato-hating husband and 7 month old daughter will eat bowl after bowl of this - so it makes a good family meal. You can use the sauce thinned down with a little stock as a soup (as pictured) or scoff it on pasta. Throw in a can of mixed beans and it also makes a good vegetarian chilli. You will need a hand blender or jug blender to make it but otherwise there is very little fiddly chopping involved - just cut the vegetables into whatever rough sized chunks you can manage. Prepare the vegetables: cut the pepper, celery, onion and carrots into large, rough chunks. Peel the garlic. Pour the oil into a large saucepan and add the onion. Cook over a medium heat for 5 minutes or until it begins to soften, then add the carrots, garlic and celery. Continue to cook for another 5 minutes, stirring occasionally. Add the pepper, tomatoes and water. Bring up to a low simmer and cook, partially covered, for 30 minutes. Remove the pan from the heat and puree the sauce with a hand blender until smooth. Serve. I love Autumn: the soft golden light; the crisp, crunch of russet leaves; and that sense of festivities around the corner. Autumn, however, does not love me - for as long as I can remember I have had an arthritis flare in September and this year is no exception. I've come to associate the first flurry of horse chestnuts with that familiar twinge in my feet and hands as Arthur makes his seasonal appearance. The practical upshot of all this is that I want to cook quick, satisfying food that makes me feel better and regular readers will know, that for me, comfort food is generally anything with rice. 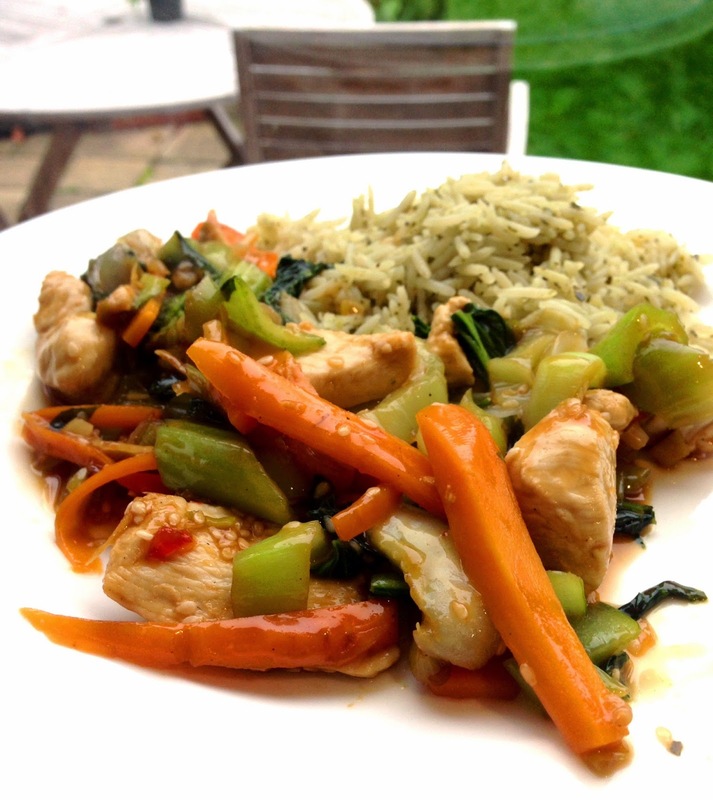 This ginger sesame chicken is easy to make but also packed full of anti-inflammatory ginger and cold-busting garlic. The sesame seeds add a lovely crunch and a calcium boost. Serve it with wholegrain rice or noodles. Heat the sunflower oil in a large wok or frying pan over a medium heat. Add the garlic, ginger and spring onions and stir-fry for a minute, then add the chicken, pak choi and carrot and cook for a further 5-10 minutes (or until the chicken is done). Tip in the soy sauce, sweet chilli and sesame seeds and give everything a good stir. Serve immediately. Sesame seeds are a great source of calcium and magnesium - both important minerals for healthy bone maintenance and especially for people with arthritis. Try sprinkling them on your morning cereal, in stir fries or using ground sesame seed paste (tahini) as a spread on toast. You can read more about the potential effects of ginger on arthritis and the most recent research here. Acid, Alkaline, Arthritis - Do alkaline diets or apple cider vinegar work for arthritis? There are many 'alkaline' diets around claiming to help cure arthritis at the moment. Or, you may be familiar with the old classic cure of honey and cider vinegar - favoured by Margaret Hills and much loved by the adventurer Ranulph Fiennes. The theory on diet, arthritis and acids goes something like this: proponents believe that arthritis is caused by the build up of too much uric acid in the body (as happens in gout) and that by avoiding certain foods (often dairy products, wheat, certain fruits and vegetables and animal fats are cut out) the body can be restored to its natural alkaline state and arthritis inflammation reduced. 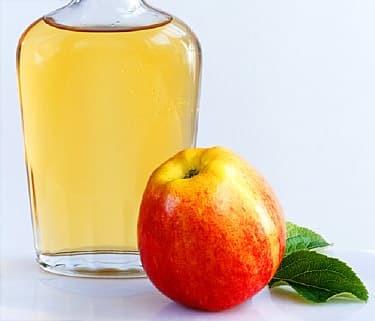 Doses of vinegar are supposed to help regulate acidity levels in the body and aid the 'alkalising' process. So does it work? Well, these kind of diets might help arthritis but not for the reasons they suggest. Firstly, acid is not the cause of arthritis. Whilst it's true that in gout, joint inflammation occurs because of too much uric acid this isn't the case for most other types of arthritis. Moreover, the build-up of uric acid in joints isn't due to dietary acid levels but is caused by chemicals called purines. In fact, if you have gout eating an 'acidic' orange will help you because vitamin C can reduce the severity of gout attacks. Secondly, the acidity levels in your body vary according to the function of different body parts. Saliva is slightly alkaline to help prevent the acids from food damaging our teeth. The stomach is highly acidic to breakdown food and kill bacteria. Your body happily controls and regulates all these different acidity levels independently of what you eat or drink. Why are there so many fans of 'alkaline' diets for arthritis then? Put simply, the food you eat on these diets is good for you. Most plans encourage you to cut out foods that aren't so healthy, like processed meats, saturated fats and sweets, and instead make wholegrains, fruit and vegetables the focus of your diet - all things we know can help improve not just your arthritis, but also your overall health. Do you ever find your arthritis very, very boring? I'm so over mine at the moment. I'm enjoying playing with my 5 month old daughter and discovering things through her eyes and, frankly, I don't have the time for sore wrists, hips or feet. It's enough to make me want to cry like a baby! One way of tackling the frustration has been to concentrate on eating well and having fun. The two don't always go hand-in-hand, but I know that when I eat well and relax well I'm more able to cope with arthritis pain. This caramel mousse delivers on both counts. It's relatively healthy and fun to make. It's full of calcium-rich greek yoghurt, low in fat and contains much less sugar than a commercial product. Calcium is so important for those of us with arthritis: It helps safeguard our bones and may even delay the progress of osteoarthritis in women, although not men (! ), according to a recent study. 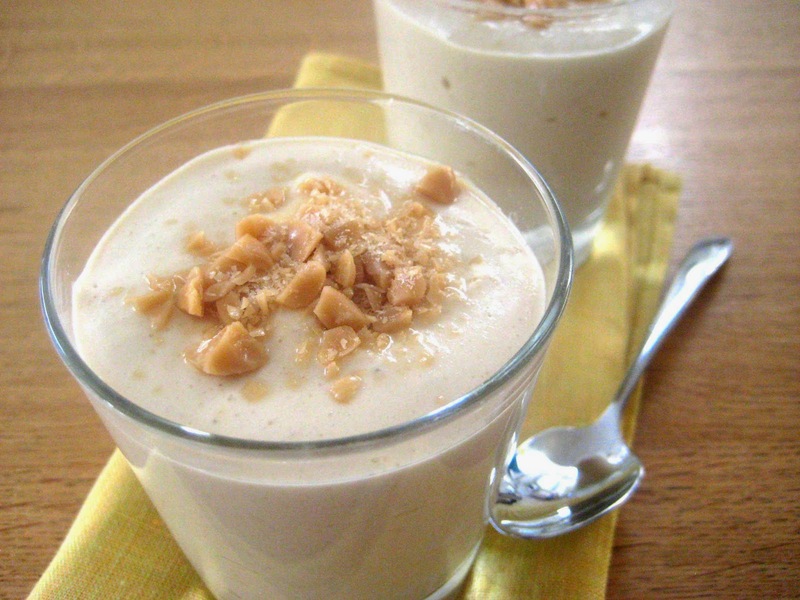 Eating plenty of low fat dairy products, pulses, sesame seeds and fortified non-dairy products is the best way to meet your calcium needs or, for a change, you can try this fun caramel mousse. In a large bowl, gently fold the sugar, syrup and vanilla extract into the yoghurt until everything is just combined. Don't overmix. Whip the egg whites until they form stiff peaks and then fold these into the yoghurt mixture. 10-12 folds should do it! Divide the mousse mixture between four glasses and leave to chill for 2-3 hours before serving. This is best eaten on the day it is made otherwise it will begin to separate. Would someone please explain to me where the phrase 'full of beans' comes from? It's an odd English way of saying someone is bursting with energy, but I've always wondered how anyone came up with it. Is it because beans are such tiny little powerhouses of nutritional goodness that they leave you with a spring in your step? Because, whilst they are, they seem to more often have a reputation for being bland, boring and basic. They don't need to be. Roasted like this the humble cannellini (or navy) bean becomes both creamy and crispy. Add some arthritis fighting fish to these roasted beans and you have the healthiest one-pan version of fish and chips you will ever come across - I guarantee it will leave you feeling 'full of beans'! A few notes on the ingredients, I use frozen fish fillets as they are both economical and convenient. If you want to use fresh fillets, simply add them nearer the end of the cooking time. 1 tablespoon olive oil, plus a little to drizzle over the fish. Roughly slice the peppers into strips and place in a roasting dish with the drained cannellini beans. Add the oil and spices to the dish and give everything a quick mix together. Bake at 180C/375F for 20-25 minutes or until the fish is opaque and flakes when gently speared with a fork. The peppers should be softened and the cannelinni beans crispy around the edges. Garnish with freshly ground black pepper and parsley to taste and serve immediately. Cannellini beans are bursting with folate, iron and magnesium - all micronutrients that are particularly important for people with arthritis. Patients with all types of arthritis are often deficient in folate (folic acid) and iron due to poor diet, the nutritional consequences of chronic inflammation and drug-nutrient interactions (see this post for more details). Magnesium is essential for strong bones and can also help alleviate muscle cramps. We're not planning a holiday abroad this year, as much as my arthritis likes the warmer weather somewhere sunny, we're getting plenty of it here and, with the little one, there is lots to enjoy at home. However, that doesn't mean I'm prepared to miss out on some of those lovely treats you get to eat abroad. Baklava will forever remind me of a wonderful sailing holiday around the Greek islands with friends. We'd eat yoghurt and honey on the boat deck every morning facing a glassy, flat turquoise sea. Then we'd round another beautiful day of swimming and sailing off by eating baklava under the stars at night. This recipe is my healthy tribute to that holiday. 2tsp orange flower water (optional, you could use a pinch of cinnamon or ground cardamon instead). Put the shredded wheat and nuts in a small sandwich bag and lightly crush them with a rolling pin. Alternatively you can give the mixture a very brief blitz in a food processor. Mix the crushed shredded wheat and pistachios with the honey, milk and orange flower water until well combined. Divide this mixture between four small serving glasses and top with 125g each of yoghurt. Refrigerate for 30 minutes and then serve. Date and walnut - You can make a date paste to replace the honey: soften 50g of dates in 100ml of boiling water for a few hours and then blitz them up in a blender to make a smooth paste. 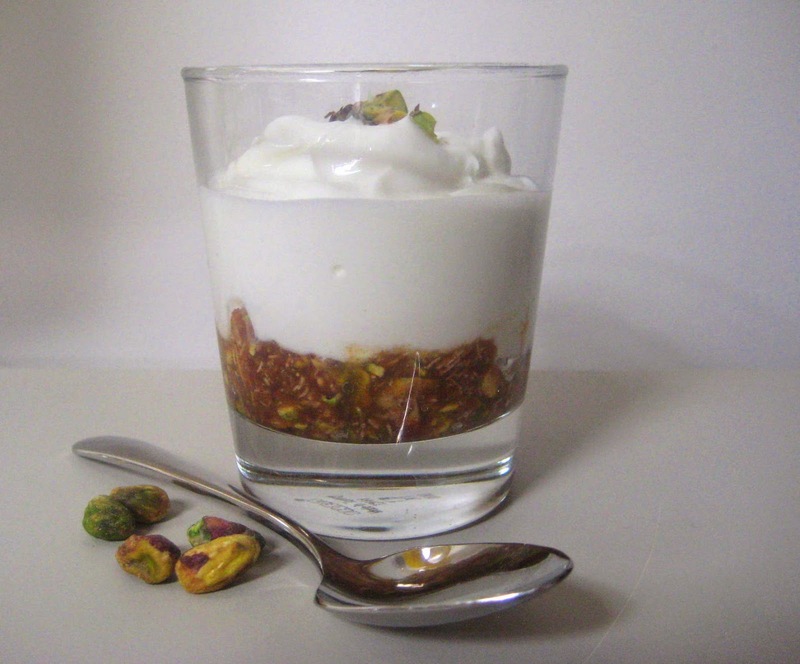 Replace the pistachios with walnuts and the orange flower water with a pinch of cinnamon. Nuts are a good source of vitamin E and healthy fat if you have arthritis. Several studies have shown that people with arthritis tend to have lower intakes of healthy fats and antioxidant vitamins, like vitamin E, than their healthy peers. Stick to no more than a small handful a day if you are trying to control your weight - several studies have suggested that swapping your usual snack for nuts (particularly almonds or pistachios) may help with weight loss as the fat and fibre can help keep you satisfied between meals. If you eat a gluten-free diet you can swap the shredded wheat cereal for a a gluten-free ones (Nature's Path Mesa Sunrise works well). Cooking with Arthur turns 3 years old! 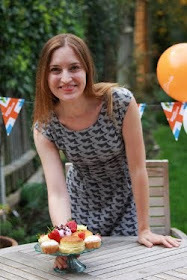 It turns out I've been blogging away about cooking with arthritis and diet for three whole years! It sounds trite but every comment, forum post and visitor to the blog makes it all worthwhile. It's lovely to know that there are others out there cooking with arthritis and trying to maintain a healthy diet. Working with and engaging with all the amazing arthritis charities and organisations out there. Perhaps unsurprisingly, anything with chocolate is always a hit with readers. My gluten free, easy chocolate chip cookie recipe has had 56,000 views and is easy to make with arthritis, even if it isn't diet friendly! One of my favourite recipes, for an arthritis friendly veggie lasagne tails in a close second. If you haven't tried it yet, do. It's so easy and tasty. Lots of you continue to search for arthritis diet advice and my posts on the pros and cons of going gluten free and the relationship between arthritis and IBS are the most read. Who knows? I'll keep on keeping on! Do let me know what you want to see more of and any design changes you'd like to see and thank you for keeping me 'Cooking with Arthritis' for the last three years. Rummaging around my kitchen the other day, I decided I wanted to make butternut squash quiche, but frankly with my arthritis playing havoc and a 3-month old baby I'd rather be playing with, I didn't feel like faffing around making a crust. Staring into the fridge, I ummed and ahhed about what I could use and then it occurred to me that the half-eaten pack of tortilla wraps would make a great quiche crust and be more arthritis-friendly! If your arthritis makes cutting squash up tricky, you can either buy prepared squash or substitute any other vegetables you like, as long as they aren't too 'wet' (so no courgettes etc). You can vary the quiche by adding different seasonings to the egg mix too, try a tablespoon of pesto or a little smoked paprika. Grease a small flan dish or 8inch cake pan with a little olive oil. Place one tortilla over the base (it should cover it completely) and then use strips of the second to cover the sides. Place the pan on a baking tray to make it easier to transfer in and out of the oven. Cut the butternut squash into dice sized cubes and steam until tender (I microwaved mine on HIGH for 5 minutes in a small bowl covered with pierced cling film).Slice the spring onion finely. Scatter the prepared vegetables evenly over the tortilla base. Beat the eggs, egg whites and ricotta together in a jug. Season with the black pepper and a little salt. Pour this egg mixture over the vegetables and top with the grated parmesan. Bake the quiche for 30-35 minutes at 180C/375F or until it is golden on top and set. Allow to cool for 15 minutes and then turn out. You can eat the quiche warm or at room temperature. This is a much healthier spin on the traditional quiche. Removing the pastry crust cuts back on butter and the ricotta replaces the saturated fat rich cream and cheese without compromising on taste. High intakes of saturated fat have been linked to an increased likelihood of developing rheumatoid arthritis and greater levels of inflammation in osteoarthritis and all types of auto-immune arthritis. Despite a flurry of recent media coverage about sevearl studies suggesting that saturated fat may not be as harmful for people's health as previously thought, I'd remain pretty cautious about eating large quantities of any animal fat. Most of the evidence still supports that eating a healthy plant based diet is best for your long term health and arthritis. Can Coconut Oil Treat Arthritis? Is coconut oil an effective treatment for arthritis? Coconut oil is certainly everywhere at the moment: you can eat it, moisturise with it and, apparently, even clean your mouth out with it. There are lots of websites and blogs claiming that coconut oil can even help treat and cure your arthritis, but is it really a miracle food? Until recently coconut had a pretty poor health reputation. You certainly wouldn't have been encouraged to use it for arthritis. Coconut is very high in saturated fat and high saturated fat intakes have been linked with an increased risk of developing inflammatory arthritis and other health conditions such as cardiovascular disease. However, the saturated fat in coconut oil is not the same as that in animal fats like lard or butter. There is some early evidence that the short and medium chain fatty acids in coconut oil may have some health benefits. For example, lauric acid may help boost levels of healthy HDL cholesterol. In addition, the polyphenols in coconut oil may have antioxidant and anti-inflammatory effects: a small animal study showed that they reduced arthritis inflammation but obviously its a long way from rats in the lab to real world results.